Over the past decade mobile phones and services have taken Uganda by storm. Thanks to the ease in getting a prepaid phone number and the relatively cheap phone prices and phoning costs, mobiles have penetrated the largest part of the population. The mobile phone has provided people, ranging from the densely populated cities to rural communities, with the powerful and life influencing means of distanced communication. These developments have opened-up new doors for health, awareness and education initiatives. 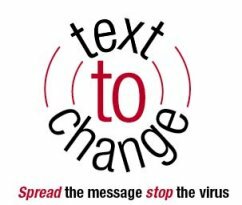 With HIV/AIDS being a large health issue, Text To Change (TTC) is “harnessing the powers” of mobile phone technology by “using it as a medium to communicate health related issues and to support existing prevention campaigns”. Through an interactive SMS-quiz which lasts several weeks, questions and information about HIV/AIDS is spread among a large amount of mobile phone users about 3 times a week. During the pilot project in 2008 (which has been a great success) a total of 15.000 active mobile users in the Mabarara region were targeted. First an announcement SMS is sent to the target group announcing the quiz taking place, giving them the chance to enroll in the program. Then the target group receives, about 3 times a week, questions regarding issues on HIV/AIDS and its prevention, the main focus points being “General knowledge about HIV transmission” and “The benefits of voluntary testing and counseling”. The target group are opted to reply to the questions, and when they do, they receive additional information on that issue if they answered correctly or they receive the right answer with additional information if they answered wrong. 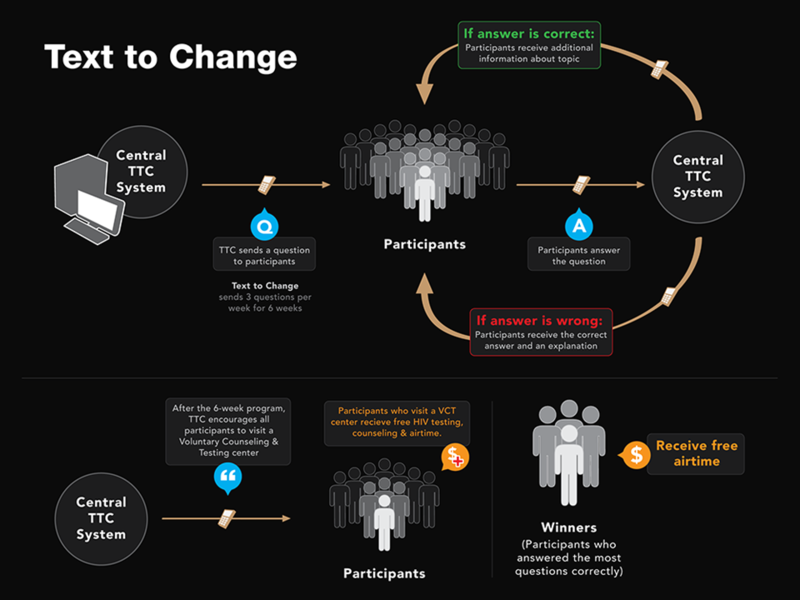 Users can earn/win airtime by engaging in the program and answering the questions correctly. At the end of the program users are provided with information on health clinics near them, and are stimulated to go there for a free checkup and HIV testing. During the program a significant increase has been noticed on patients who came in for testing during a six week period, from 1000 to 1400. This shows the actual impact the project has and the potential it possesses to support in education, awareness and combating disease. Through this program valuable data and information is collected on the current state of knowledge and awareness amongst the population, which in turn is relayed to health clinics and other organizations in order to improve programs and methods. As they state, “Text to Change aims at establishing partnerships between governments, public and private companies, non-governmental organizations (NGO’s), financial institutions and medical experts. Joining forces to achieve a common goal for mutual benefit by sharing skills, resources and risks could be the key to an actual change”. All together, the TTC project provides a solid base for communicating relevant knowledge to the masses, educating the nation and fighting disease strategically. By seeking a broad range of partnerships and redeveloping their software in open-source they expand the range of possibilities and thus the impact the program can have nationwide (and even continent- or worldwide). Therefore Text To Change is in my opinion, well on its way in achieving their ambition, which is, “to become a global platform of telephony health services”.